Hello! My name is Ilze Rozeberga and I am going to be a volunteer for 1 year at Smokinya Foundation. I´m 19 years old and was born and lived in Latvia. I have recently finished high school and for about half of the year before graduation I decided to go abroad – with traveling or being a volunteer – in which way it didn’t matter to me. Step by step – keeping this decision in a secret from many people for a long time – hard and challenging, but finally I´m here – in Bulgaria. 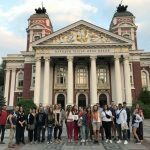 Volunteering abroad was one of my dreams so practically I came to Bulgaria to follow my dream. I decided to become a volunteer because I really enjoy helping others at the same time developing myself. I believe that this is going to be an interesting journey – learning in informal way, every day being in different situations, in different country – it is challenging and exciting at the same time. I really want to learn how to develop my competences and skills that I already have and who knows, maybe I will find something that I didn’t even know have existed all the time. 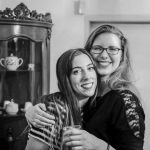 And even more – being here in Sofia I will be able to learn about completely different culture and maybe even manage to fit perfectly in it. Will see how it goes! This volunteering project is financially supported by the Erasmus+ programme for youth educational mobility.